However, once back in Civvy Street, the camaraderie was gone; he found himself a prisoner of war to PTSD. Dehumanized by those professionals who he had turned to for help, this Special Forces veteran and former Legionnaire was brought to his knees. His marriage was over; his home was lost. In isolation, his world unraveled, and the seeds of destruction had been well and truly sewn. Knowing he would never see military action again and faced with the realization of the war raging within him in the spiral of PTSD, John-Paul felt condemned as a man. But, on 1 April 2016, he surrendered – life, too, it would seem, has a sense of humour. He asked for help … and found the answers within. John-Paul Jordan is a former Legionnaire with the French Foreign Legion, after which he joined the British armed forces, serving in operations in Afghanistan where he awarded for his actions in combat. 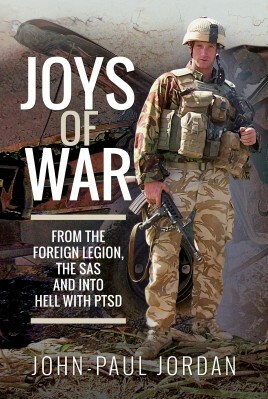 Following his military service, John-Paul worked for international media organisations in warzones, clandestinely moving journalists in and out of some of the world's most dangerous hot-spots, before heading up logistics for a mining company in Afghanistan and training local forces.His personal injuries from war took their toll with the effects of physical injury and non-visible injuries, PTSD. As part of his own recovery, he wrote about his experience to share his story with others and liberate himself from the stigma of PTSD and mental health issues – or what he terms non-visible injuries…because that’s what they are: an injury to be treated like any other.John-Paul’s mission is to help veterans and non-veterans alike to find their way to freedom. To start the conversation. Remove the stigma and live in the solution not the problem. More recently he has been working closely with the charity Mind, including advising on the set of a national television programme, sharing his experiences of injuries from war.